Day Off: Anyone signed up for Stillwater bus ride: bus will load/depart 9a at Flynn Circle, next to building #7. Many other players are only one or two games behind the leaders, so play more self-paired games! Phil’s Photos: Check out EJ photog Phil Straus’ latest album of photos on his Facebook album. Both the AGA Teacher Certification and the Tournament Director Workshops kicked off Monday afternoon. This is the third year for the Teacher Certification, consisting of four 2-hour sessions, which have been a great success. 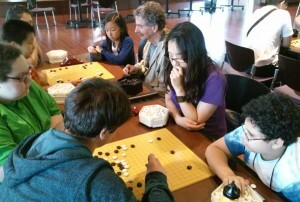 Nearly two dozen participants showed up for the first session Monday afternoon, which was about learning to teach go to an absolute beginner. Later sessions will focus on teaching DDK, SDK players, and one-on-one teaching. Chris Kirschner conscripted a volunteer from the campus staff at St Thomas University, where the Congress is being held. Interested but somewhat mystified, Diane Kruger, Associate Dean of Finance and operations, College of Education, Leadership and Counseling, stood at the demo board while Kirschner demonstrated how to teach someone to play go for the very first time. He was quite entertaining and encouraging and fielded questions from the audience about various teaching methods. 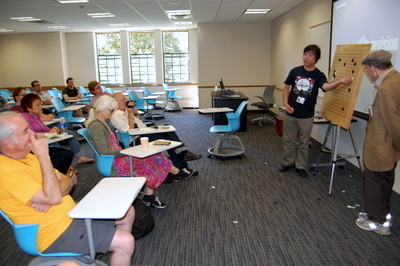 Before the session was over, not only had his volunteer learned some of the basics of the game, but she was eagerly requesting contact info from everyone to continue learning and also to share with the rest of her faculty staff. This is the first year for the TD Workshop, and actual certifications will not be granted at the end of the four 1-hour sessions, as the format is still evolving. Topics will cover pairing, reporting, and organizing for your own local tournament. To encourage new TDs, the AGA will provide mentoring help from established AGA TDs as they start their first tournaments. 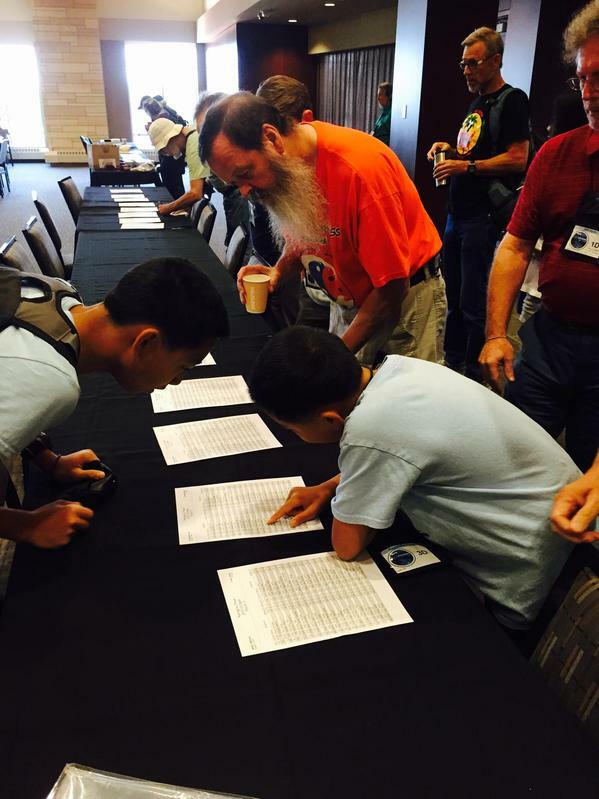 A number of experienced go teachers and tournaments have been enlisted to share their knowledge and mentor interested members for both workshops. A schedule of events was included in Congress welcome packets. 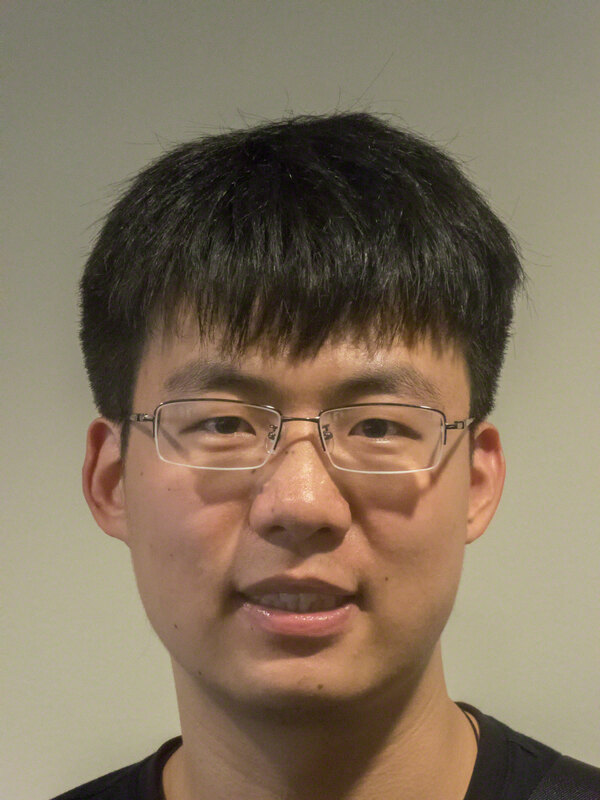 Myung Wan Kim will be teaching Thursday 1 to 3 — “Mathematical end games”, that is, counting — and “After school programs” on Saturday 1 to 3. Kirschner and Maeda will be teaching the “one on one” session on Friday. Xinyiang Jiang 7d and Xiangnan Zheng 7d took first place at the top table at Youth-Adult Pair Go at the Go Congress on Aug. 4th. 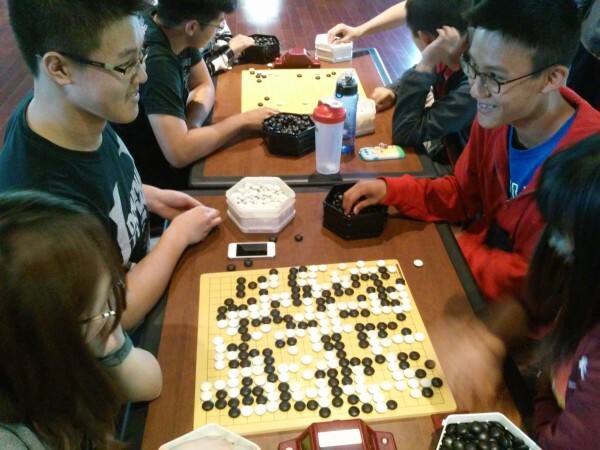 Often a warm up for the official Pair Go Tournament on Thursday night, the more casual event gives many teams their first chance to play pair go in a tournament setting. 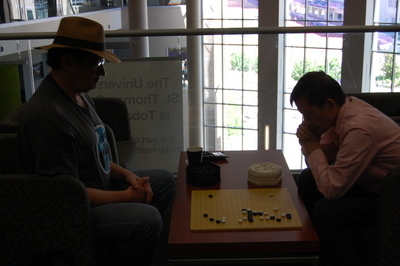 18 pairs competed for prizes and fun, with pros Hajin Lee 3P and Calvin Sun 1P both getting in on the action as well. Rengo pair Yunxuan Li 6d and Ashish Varma 4d took first place at table two, while Andrew Zhang 7k and Nqua Xiong 3k won at table three, Steve Zhang 17k and Collette Bezio 11k won at table four. Bezio, the author of Aji’s Quest is attending her first Go Congress, and described her 7 year old partner as “amazing”. Other youth events this week included Lighting Go, 9×9, and 13×13 mini tourneys. Team 13×13 Rengo, with three players on each team alternating moves, and the 19×19 Youth Team Tourney are set for Thursday and Friday. -Story and Photo by Paul Barchilon, E-J Youth Editor. 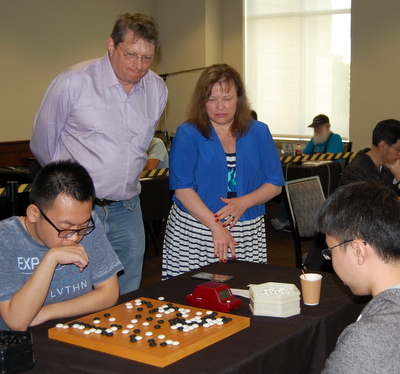 Upper Left: Xinyiang Jiang 7d and Xiangnan Zheng 7d (l) play Albert Yen 7d and Chang Yun Hsin 6d; Hajin Lee 3p and Kiren Polora 8k (r) play Ethan Frank 6k and Sherrie Echols 9k (l). In the semifinals of the first-ever AGA Girls’ Under-16 Championship held Monday at the Twin Cities US Go Congress, Kelly Liu 1d upset Amy Wang 5d in a hard-fought match. In the other semifinal, Melissa Zhang 3d beat Melissa Cao 1d when she chased a one-eyed group across the board and denied it a second, life-giving eye. Ms. Liu will now play Ms. Zhang for the championship and a $100 first-place prize on Thursday at 1 p.m., while Ms. Wang will play Ms. Cao for third place. Update: the headline has been updated; Liu did not win the Championship but will play Zhang on Thursday in the final. 13×13 Table Winners: Justin Teng 6D, Melissa Zhang 3D, Julian Erville 1D, Peter Schumer 2K, Xiong Nqua 3K, Sherrie Echols 9K, Mathias Kramm 7K, Steve Zhang 17K. Self-Paired Update: There have been 46 games played so far. This rated tournament is open to anyone who wants to play; see page 12 in the Congress handbook for details/rules. The first day of this year’s US Go Congress on Sunday featured the first round of the US Open — in which 253 players participated — and Rounds 1 and 2 of the US Open Masters, in which 26 top players, including nine professionals this year, are playing for over $7,000 in cash prizes. Click here for the Masters crosstab. Defending Masters champion Mark Lee is off to a good start, notching successive wins over Calvin Sun and Michael Chen. 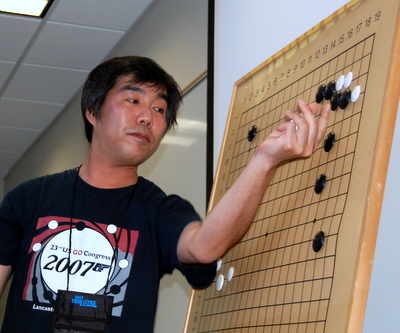 Go players also had plenty of other activities to choose from during the day, including lectures and simuls with professional go players like Mingjiu Jiang 7P, who was operating on just a few hours of sleep after arriving late Saturday night and then playing in the first round of the Masters Sunday morning (and would go on to play in the second round after lecturing all afternoon). The 13×13 tournament was held Sunday night; we’ll post results on that and on Saturday’s 9×9 tournament as soon as we get them. Redmond Cup games were also held today; watch a report on those results soon as well. The E-Journal’s expanded coverage proved a great success as Andrew Jackson anchored live video streams and game commentary on the AGA’s YouTube channel. As usual the EJ team broadcast top-board games on KGS along with pro game commentaries, and photos and updates were posted on the AGA’s Twitter feed — follow us @theaga (#gocongress #congress2015) — and Facebook throughout the day. Live coverage begins Monday at 9a (CST) on KGS and Facebook. 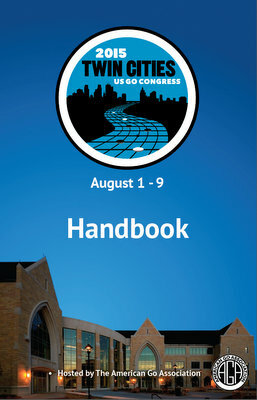 NOTE: email us at journal@usgo.org if there’s anything in particular at the Congress you’d like to see included in our coverage. 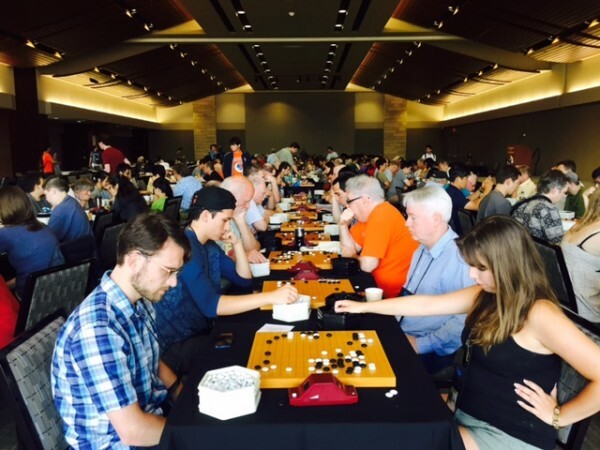 Hundreds of go players from around the world — including the first-ever delegation from Cuba — gathered Saturday on the campus of the University of St. Thomas in St Paul, Minnesota for the 31st annual US Go Congress. 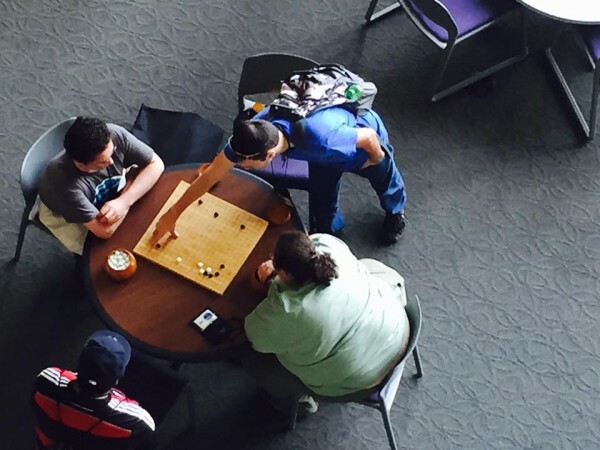 Old friends reunited and new ones were made across the go boards that spilled out of the main playing room into the student center’s atrium (photo). The US Open/Masters tournament begins on Sunday; play is scheduled to begin at 9a (CST); top boards will be broadcast live on KGS (look for usgo accounts) and pro commentary by Jennie Shen will begin at 10a. Other highlights of the Sunday schedule include a live Haylee go match; click here for the complete schedule. Keep up with all the E-Journal’s Congress reports this week on the AGA website, on Facebook — “American Go Association” — and Twitter — @theaga. New this year: live video broadcasts of games; watch on our YouTube channel (usgoweb).